being created by sinus man!!! and didn't sneeze on me once!!! no more dish hands for this little brown duck!!! It's so nice to know that as I get ready for sleep, wonderful and beautiful art is being made on the other side of the world!! Have a fabulous day and war some cake for me! What a colorful, lovely, lovely desk!!! 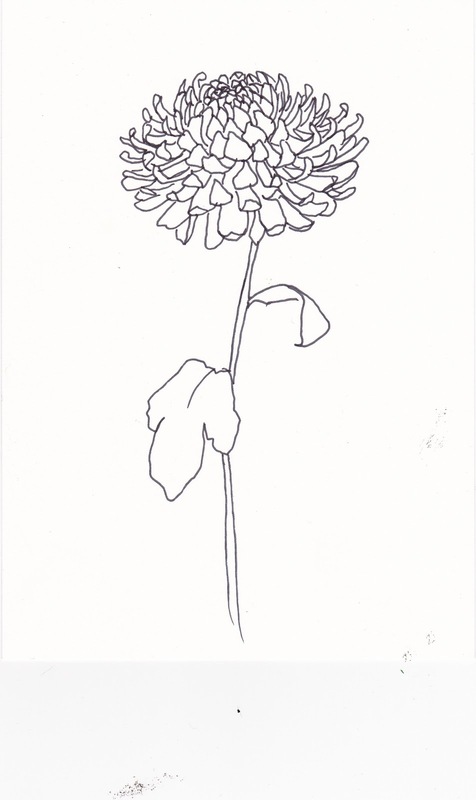 Lovely flower chrysantha thingy (!) and lovelier teacup. I can't wait to visit your blog each day and read about your adventures. I'm sure your days are much like everyone elses - but the way you write, woman! You make me smile! Your art is beautiful and those note books are lovely. Enjoy your cake and dishwasher. beautiful art and i laughed so much at your descriptions of sinus man... my hubby is quite similarly "blessed" :) your work area looks wonderful and that last design is lovely - you could license it! Hi there. Thanks for letting us peek into your creative space this week. It's always inspiring seeing where and how we create! Hope the rest of your week goes very well for you. I think your chrimbo card is lovely; something slightly different is always good. ha ha, yes I know about that. Love the flower. Actually I kind of like it just as it is, without any colour. Just really simple and beautiful. 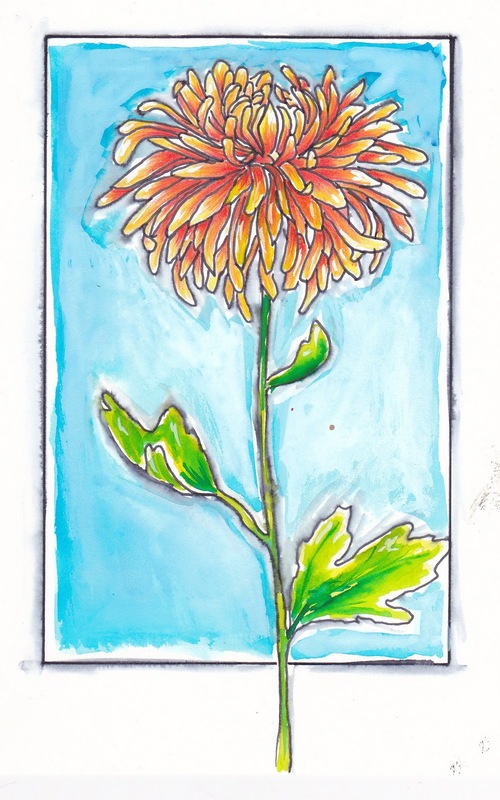 Beautiful cards, you are so talented, wish I could draw like that but my best is a daisy. Dishwashers are such a lovely thing to have in the home! The brains on mine went wonky. It would either not turn on or turn itself on the longest running cycle. This duck has had to return to the ugly task of washing dishes by hand. The dishwasher now stores extra baking pans. You accomplished quite a bit! "Sinus Man" ha ha ha... I may have to steal that one. I have one of those too. I have resorted to sleeping with earplugs some nights! I love seeing your desk, its so inspiring! I am laughing at your name "Sinus Man" haha! I have one myself:) He's lucky I sleep like a rock most times! 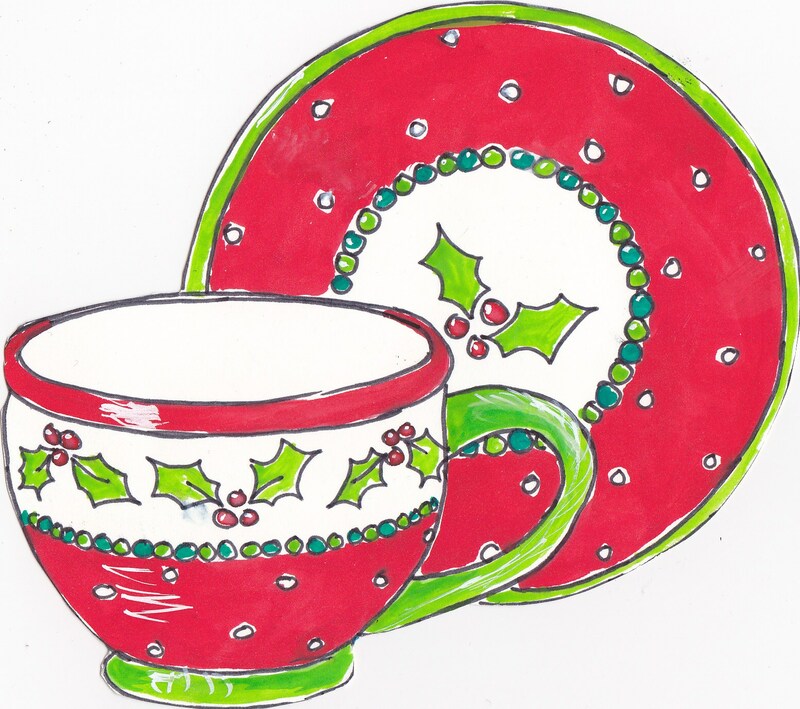 I like your holiday cup and saucer alot! You are movin' and groovin' lady! I'm motivated now and ready to start my day! PS Congrats on the dishwasher, ours is heading south. That's an upgrade we need to look into in 2012.
dishwashers are the best!!! 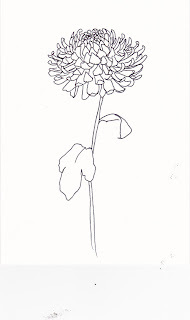 Great chrysanthemum :) And so many beautiful drawings on your desk - wow!!! oh wow!!!! this post is like a feast for the eyes!!! I love your new floral piece and everything in your studio makes me smile!!!! wonderful work!!!! your desk looks so colorful and happy! Really enjoy your sketching and you've inspired me to do more... thanks. 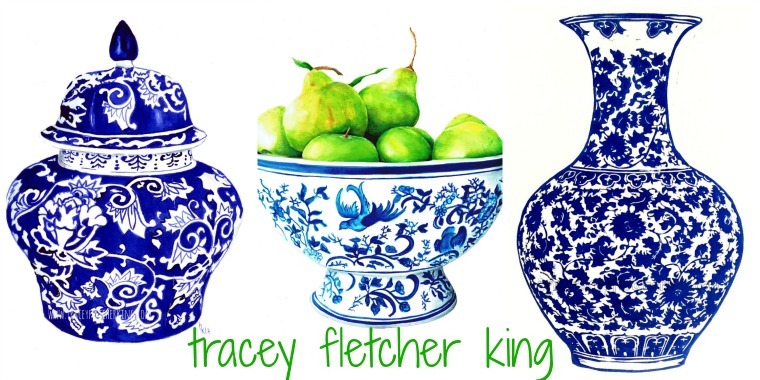 Beautiful artwork, have you got a thing for tea??? Loved the Hubby story, at least he was honest! 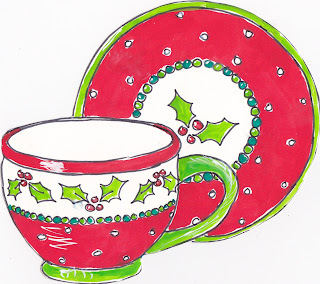 I love your Holly tea cup, what a perfect, but totally different Christmas card it will make! Stunning work....just stunning! Great post today you made me laugh and that's a good thing! I hope your lunch was yummy cause mine consisted of left over stir fry veggies! Thanks for letting me peek and have a super week! Beautiful style of cards which I love. Fab art! My DD snored badly for years then they found he has sleep apnoea ( he stops breathing completely!) so now he has a machine to make him breath properly and it's bliss! Lots of gorgeousness going on all over your desk! Mmmm scrummy chocolate cake hope you enjoyed it! What fantastic art work, I wish i was half as talented. And yes, as soon as I find another 12 or more hours in my day I will adopt you and make you lovely things. Thank you for your kind comments. Lovely artwork, I really like your christmas one. 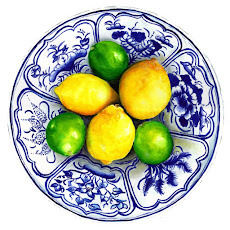 I have a dishwasher - my other half :) Thanks for popping by my blog, hopefully I'll get a grip on the business thing. Your art continues to inspire and amaze me - such eye-catching colors you use with each piece you create. As a side note, I like how you have your colored pencils grouped by colors in the cups. What a great way to have them accessible as you create. My youngest daughter (who loves coloring) would be delighted if I could rig something up like that for her! I hope you enjoyed your chocolate cake...my favourite flavour. Love all your artwork, but my fav is the unusual point of view, looking down onto the teapot. Boy, have you got the angle/perspective spot on!! You're very talented!! Ah Tracey, am revelling in your snore free sleep! How marvellous of him! Loving your designs, and the fresh painting colours, gorgeous. Am delighted that WOYWW made you feel obliged to do something Christmassy - and it's lovely...I've never been involved in trend setting before!! Oh they are beautiful, love the design, and so glad you got a dishwasher, mine broke a couple of years ago, and hubby still hasnt got round to replacing it for me!!! Hi, I think your teacup designs are gorgeous. Particularly the stacked ones, but the Christmas one looks lovely too. I know what you mean about the fingers and glue. My computer had trouble registering my fingerprint sign in last night and I'm pretty sure I have altered the skin too much with glues, sealers and stuff to get them off with! Thanks for your kind comments on my blog. Much appreciated! Sorry bit late been going round in stages ! !